Unlike some utilities, water and sewer accounts with Lake Whatcom Water and Sewer are attached to the property where service is provided. This means the account will always stay in the name of the owner as shown on the property deed. If you are selling or purchasing a house in the District, the account will be updated upon the closing of the sale. 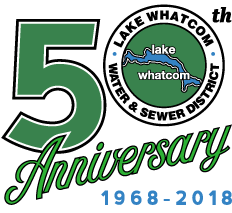 After the sale closes, the title company will send Lake Whatcom Water and Sewer District a copy of the deed with the new owner’s information. The amount of the seller’s final bill is generally paid by the title company as part of the closing process, including the $30 account transfer fee. The District’s accounting department will then update the account to the new owner’s information without interruption in service or billing. If you are selling a property for which you have set up Automatic Payment and/or Paperless Billing through Xpress Bill Pay, you will need to log in to your account to cancel the automatic payments and remove your email address. If you are renting a property in the district, it is between you and the owner or property manager to figure out how initial and final bills will be split when necessary. Click here for more detailed information about rental properties. If you own a property in the District, but only reside there for a portion of the time or will be away for an extended period, you may want to consider billing suspension. At the property owner’s request, water and sewer service billing may be temporarily suspended and service discontinued. Once the full account balance and the $150 lock fee are paid, and a completed lock form received, the meter will be locked and billing will be suspended. 24-hour notice is required to have water and sewer service restored, and services will only be unlocked during regular business hours, Monday – Thursday. Use the form below to request a temporary billing suspension.